On 30th June we had the pleasure of announcing the general availability of Dyalog 14.0. From our point of view, one of the KEY benefits of version 14.0 is that it enables subject matter experts to – literally – have parallel computing at their fingertips. CTO Morten Kromberg of Dyalog Ltd said "What you can expect from Dyalog version 14.0 is faster development, faster execution, less storage consumption and network traffic and integration with a number of external tools. With the release of version 14.0 we continue to set new benchmarks, and users will get the most significant release of our software in recent times. "Specifically, Dyalog version 14.0 will provide software developers with new core language features that will allow them to express calculations more easily, producing code that runs faster than ever before. Many of the new features allow the use of more functional forms of expression, paving the way for parallel execution and compilation. Outside of that, we have put huge focus on faster execution. This means that it will be straightforward to take advantage of all the processor cores available, using parallel versions of each, rank, key and outer product as well as isolates, which are namespaces that execute code in parallel to the main process. Several beta testers have reported performance increases of between 10% and 30% on upgrading to version 14.0 – and that's before taking advantage of any new language features. No matter where a developer's focus lies within the domain of developing systems in APL, Dyalog Ltd feel comfortable claiming that version 14.0 will contain at least one feature that will make a significant difference to their work!" Support for direct data binding between APL arrays and Microsoft .NET components that support data binding (such as most Windows Presentation Foundation controls). Enhanced Integration with external tools including an interface to the R statistical package, bundled with Dyalog under Microsoft Windows and Linux, and a version of the SQAPL ODBC interface that supports UNIX ODBC drivers, bundled with version 14.0 for Linux (SQAPL has been bundled with Windows versions of Dyalog for more than a decade). Existing customers have already received notification via e-mail about the availability of the free upgrade to version 14.0 through their DSS (Dyalog Support Service) subscription. We also offer students a free version of Dyalog version 14.0 for Microsoft Windows or Linux. Dyalog Ltd further continues to support new programmers, therefore we offer a personal non-commercial version for a nominal fee. 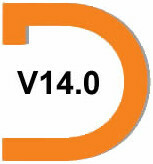 To download of Dyalog Version 14.0, visit our Download Zone. More information about Dyalog version 14.0.